World Opponent Network or WON was an online gaming service, created by Sierra Games as the Sierra Internet Gaming System (SIGS). WON was used by games such as Homeworld, Half-Life, Outpost 2, Star Trek: Armada, Soldier of Fortune, Dark Reign 2, and Silencer, ARC in addition to online versions of casino games and early entries in the Hoyle games series. Sierra was purchased by Havas in January 1999 and Cendant Software became Havas Interactive, which came to control WON. In March 2000, Havas Interactive merged WON.net with Prize Central Net to form Flipside.com. Regardless, games such as Valve Corporation's Half-Life continued to use the service. In 2001, Valve acquired WON from Flipside.com and began to implement the Steam system in beta form. Over the next few years, as Steam was developed and tested, WON continued to operate. Valve shut down the last of its WON servers on July 31, 2004. All online portions of Valve's games were transferred to their own Steam system. The announcement disappointed some of the long-time Half-Life and Counter-Strike players who had become accustomed to the older versions of those games still being hosted on the WON servers. 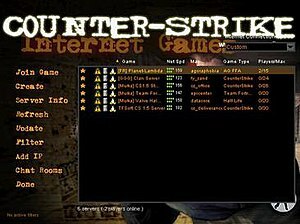 For example, WON servers hosted version 1.5 of Counter-Strike, while Valve's Steam system required users to update to the newer version 1.6. After the shutdown of WON, some players continued to run patched versions of the games Half-Life or Counter-Strike to connect to a free service called WON2 (or No-WON), an entirely coded from scratch (and therefore legal) replacement for WON. It allows users to use the original server browser to connect to Half-Life servers, and their various mods (including Counter-Strike 1.5, and a Steamless version of 1.6). ^ "Steamless CS Introduction". Steamless CS. Retrieved 29 December 2017. ^ "Concurrent WON2 Servers and Users". WON2 Server Network. Retrieved 29 December 2017. This page was last edited on 27 January 2019, at 22:03 (UTC).